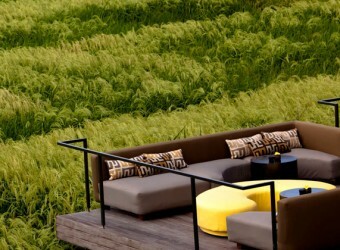 Bali Restaurant Enjoy rice field scenery at daytime and romantic atmosphere with candlelight at night. The lobby decorated with antique furniture overlooking rice field. The restaurant has sofa, semi open & open style seating, and 10 special seats also available for parties. Cuisine made by French chef are excellent, especially Foie Gras. A wide choice of wines is also available. Table seating was fully booked because I didn`t make reservation before, and I went to lounge seating. Seafood pasta was relatively delicious and the taste was neither good nor bad. It was common taste of seafood paste.